As any hospitality businesses will be aware, the ferocity of the festive season makes the months that follow a very hollow period in comparison. January and February are notoriously quiet, and the Christmas marketing efforts can sometimes distract from trying to make the first couple of months of the new year any busier. That’s where our new winter offer could come in very handy – an intensive 8 or 12 week period of digital marketing to see you starting 2018 armed and ready for success. This includes an initial 2 hour meeting to really getting to know what you do, and what makes your business special. We’ll go through a business analysis with you, which helps us dig deeper into what goals you’d like to achieve, who you’d like to appeal to, and what needs to be done in your online activities to reach them. We can have a good old chat about it, giving advice on things like social media, email marketing, and promotional opportunities, shaping a strategy for the next 8 or 12 weeks. We then take care of it all – from content creation and social media management, to web updates and email marketing (provided you’ve got a database already), for the time period you’ve chosen. This will increase your exposure in time for the start of the quiet period, as well as being proactive during it. We’re also offering it better than half price, with 8 weeks at £295 (usually worth around £700), and 12 weeks at £495 (usually worth over £1000). Budget for any social media advertising would be additional, but is not obligatory. This is an opportunity for hospitality businesses to take advantage of our experience in the industry and get ahead of the competition for the new year. Fancy heading into 2018 with booked tables and/or occupied guest rooms? Contact us via the form below to take the next steps. 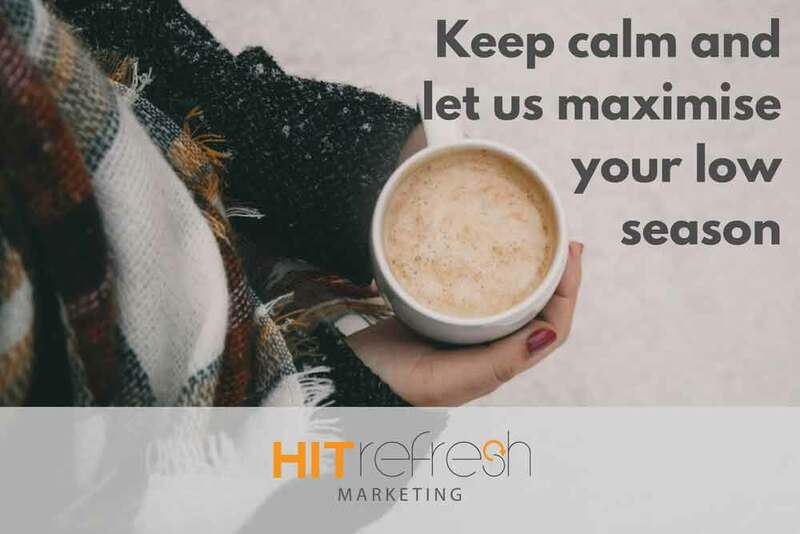 Contact us on 01903 823843 or info@hitrefreshmarketing.co.uk if you have any questions.